Workmen uncover a buried alien spaceship. 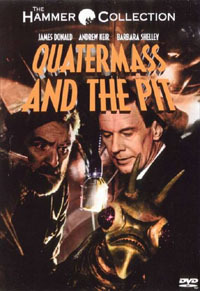 One of Anchor Bay's most interesting early DVD projects was a spruced-up version of the 1967 Hammer film version of Quatermass and the Pit, (a re-make of the classic BBC chiller). The disc is presented in widescreen ratio of 1.67:1. Compared to Encore’s PAL laserdisc and previous VHS versions, the DVD adds a significant amount of picture information to the sides, but crops a sliver off the top and bottom. The picture has an NTSC sheen to it, but is far sharper, and has much stronger colour than previous home video incarnations. There are a few blemishes, but it's unlikely that anyone could have sourced a better print. In a controversial move, the sound has been given an aggressive overhaul, and is presented in both Dolby ProLogic (2.0) and Dolby Digital (5.1) formats. It’s a shame that the original mono soundtrack wasn’t included. Most fans of the film will be thrilled with Anchor Bay’s thoughtful and clever remix, but the disc's producer has subsequently admitted that the omission of the original mix was a mistake. The disc has several enticing extra features on the flip-side, including a handful of theatrical and TV trailers, (including British and American variations), a commentary track by Nigel Kneale and Roy Ward Baker. Like many of Anchor Bay's early Hammer DVD releases, the disc includes an episode of the 1990 TV series World of Hammer, titled Sci-Fi, (which includes clips from several Hammer movies, including X The Unknown and the other two Quatermass films). If their licence holds out, it's likely that Anchor Bay will eventually re-master the disc.